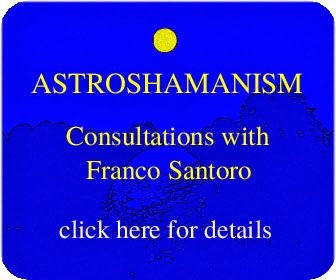 Astrological workshop with Franco Santoro. In English. This workshop is an intensive course on astrology for participants interested to apply astrology for spiritual and personal growth, in the counselling and shamanic arts, and for discovering and manifesting their potential. The workshop consists of two modules, which can be attended independently. The first module (two days, 1-2 March 2014) will be held in Frankfurt and the second (three days, 3-5 March 2014) in Vogelsberg. More details to follow. This in-depth intensive seminar teaches the basic tools of experiential astrology as applied to astroshamanism. The workshop provides a thorough experiential introduction to astrology and its healing applications, with visionary explorations of the natal chart and the starry sky, understanding of the basic elements of the astroshamanic binary system. We will employ the astroshamanic circle on the floor to directly experience the essential individual features of the birth chart and reconnect them with the collective planetary rhythms. The aim is to employ experiential astrology to support major processes of transformation, discovering, acknowledging and implementing appropriate and beneficial uses for our healing resources and talents. By examining the essential astrological grammar we will learn simple and effective ways to employ astrological information and use it to enrich and support healing work.